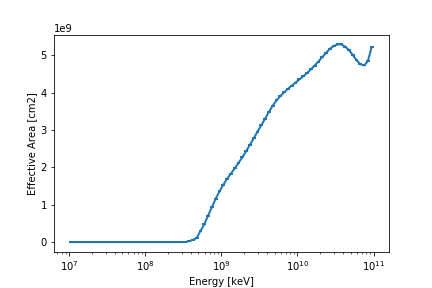 This PR moves the energy threshold computation to the EnergyDispersion class, so that it can be re-used for 3D analysis. It also adds tests and simplifies the algorithm to find the bias energy . Thanks @adonath , seems a much better implementation like this, but how much do we loose by not having the reverse option? How is SpectrumObservation.compute_energy_thresholdaffected? OK for the code change, but I really wonder why one needs to find the true energy value where the bias becomes larger than a given value. You would normally look for reco energy if you are to find a threshold, no? I find it a bit strange to have to import models here. Maybe at some point a utility function to perform the root search on a NDDataArray for instance would be more general. We the new implementation, we rely on brentq to find a root but we don't control where it will be located i.e. closest to lower bound or higher bound. Is this an issue? As far as I can see the reverse = True option is used in SpectrumObservation.compute_energy_threshold . 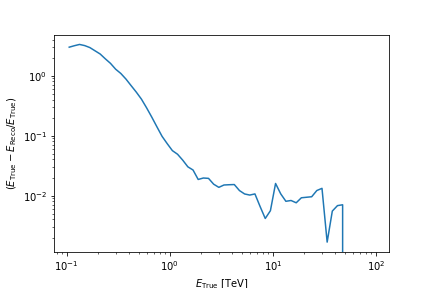 In this case, when you look for the energy where the bias is ~3.1 it's again not unique. At the high energy end its even worse, because of noise. This is indeed not a simple problem, because you never know what the curves may look like. I like the idea of using a restricted energy range -- ideally we would provide default values for emin and emax that work well in most cases (maybe you tried that already, see my other comment). The question whether the high-energy bound should be determined from the effective area / bias histogram at all or if something else would be better is also valid. I don't have a good suggestions for an alternative definition, though. Simply use the energy up to which the effective area is provided?! What's e_center? I can't find it in the code...? Is this an attempt to pick reasonable default values for emin and emax, so that the algorithm is as stable as possible?